Emperor Go-Reizei (後冷泉天皇, Go-Reizei-tennō, August 28, 1025 – May 22, 1068) was the 70th emperor of Japan, according to the traditional order of succession. Go-Reizei's reign spanned the years 1045–1068. Before his ascension to the Chrysanthemum Throne, his personal name (imina) was Chikahito-shinnō (親仁親王). Go-Reizei had three Empresses and no Imperial sons or daughters. February 5, 1045 (Kantoku 2, 16th day of the 1st month) : Emperor Go-Suzaku abdicated; and his eldest son receive the succession (‘‘senso’’) on the same day. Shortly thereafter, Emperor Go-Reizei formally accedes to the throne (‘‘sokui’’). The following year, the era name is changed to mark the beginning of Go-Reizei's reign. February 7, 1045 (Kantoku 2, 18th day in the 1st month): Go-Suzaku died at the age of 37. 1051 (Eishō 6): In Michinoku, Abe no Sadatō and Munetō instigate a rebellion which becomes known as the Nine Years War (1051–1062) because, even though the period of strife lasts for 11 years, the actual fighting lasts for nine years. 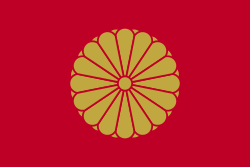 In response, Minamoto no Yoriyoshi is appointed governor of Mutsu and he is named chinjufu shōgun. He is given these titles and powers so that he will be able to restore peace in the north. Yoriyoshi would have been the first to receive this specific shogunal title, although his grandfather (Minamoto no Tsunemoto) had been seitō fuku-shōgun (assistant commander for pacification of the east). May 22, 1068 (Jiryaku 4, 19th day of the 4th month): The former-Emperor Go-Reizei died at the age of 44. Go-Reizei had no direct heirs. 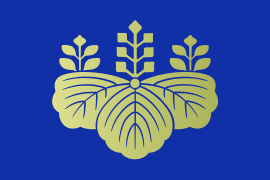 Decorative emblems (kiri) of the Hosokawa clan are found at Ryoan-ji. Go-Reizei is amongst six other emperors entombed near what had been the residence of Hosokawa Katsumoto before the Ōnin War. The actual site of Go-Reizei's grave is known. This emperor is traditionally venerated at a memorial Shinto shrine (misasagi) at Kyoto. The Imperial Household Agency designates this location as Go-Reizei's mausoleum. It is formally named Enkyo-ji no misasagi. Go-Reizei is buried amongst the "Seven Imperial Tombs" at Ryoan-ji Temple in Kyoto. The mound which commemorates the Hosokawa Emperor Go-Reizei is today named Shu-zan. The emperor's burial place would have been quite humble in the period after Go-Reizei died. 1 2 Brown, p. 311. ↑ Brown, p. 311; Varley, H. Paul. (1980). Jinnō Shōtōki, p. 44; a distinct act of senso is unrecognized prior to Emperor Tenji; and all sovereigns except Jitō, Yōzei, Go-Toba, and Fushimi have senso and sokui in the same year until the reign of Emperor Go-Murakami. 1 2 3 Brown, p. 313; Varley, p. 198. 1 2 Moscher, Gouveneur. (1978). Kyoto: A Contemplative Guide, pp. 277–278. 1 2 3 4 5 6 Brown, p. 312. ↑ Titsingh, pp. 161–166; Brown, p. 313.